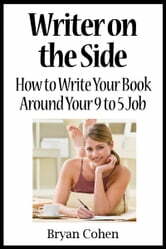 Writer on the Side is a time management, positive thinking, long-term goal creating, personal effectiveness improving, success manual for the author wannabe trapped in a 9 to 5 (or some other exceptionally long time-frame) line of work. Just because you have to pay the bills does not mean that you can't find creative success and get things done outside of working hours. Take control of your life by learning tips and tricks to help you focus on writing productivity inside and outside of work. The book goes through your entire work day from beginning to end with sections on your morning, afternoon, evening and weekends so that you can mine whatever time you have for writing gold. Filled with a plethora of ideas that have helped the author write his own books in his spare time, Writer on the Side can help you to be more productive and to be a happy and healthy author, no matter what you do for a living! Writer on the Side takes the time management of writing to a whole new level by including ideas so that you can manage your energy more effectively as well. Not only will a trip through the book get you on the right path for creating your writing goal, but it will also help you with stress management, re-purposing your subconscious mind and therapeutically ridding yourself of negativity. Author Bryan Cohen's books on writing and self-help have sold over 5,000 copies.